SAN FRANCISCO―Speaking Tagalog was a potentially costly offense when I was growing up in Quezon City in the 1970s. At my elementary school in Cubao, one got fined five centavos for speaking it on campus and breaking a speak-English-only policy. It was a silly rule. And during a recent visit to my old school a sign suggested it was still being imposed. 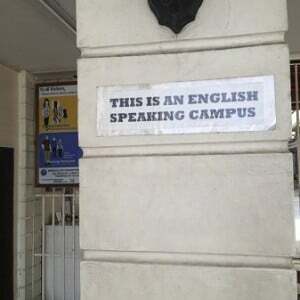 “This is an English Speaking Campus,” the sign said. That was disappointing. But that was nothing compared to the case of the three Ilocos Norte students who were kicked out of school for speaking Ilokano and violating a Laoag school’s speak-English-only rule. They were “advised to transfer,” though, the school’s legal counsel told Rappler. The parents were “too hasty” in taking that advice, he added, for they could have simply protested so that the “matter could’ve been resolved at the earlier stage,” he told Rappler. In other words, the students and their parents overreacted, although based in the account by Ilocos journalist Herdy Yumul, it was the school’s principal who was guilty of an over-the-top and stunningly cruel reaction to the students’ offense. English is important. I join others in wanting to see it grow and thrive in the Philippines, in hoping to see young Filipinos not only learn it together with other languages. But it’s frustrating to realize that some still hope to achieve this with inane policies. And speak-English-Only rules are so 70s! The intention may be good, but as the Laoag experience shows, they can be counter-productive, even harmful, especially in the hands of administrators with fascist tendencies. Language has long been a touchy subject in the Philippines. But I’ve been happy to see positive changes. In social media, young Filipinos are more comfortable communicating in Pilipino. Most newscasts are now in Pilipino. There are fairly successful efforts to revive literature and theater in other Philippine languages beyond Tagalog. I myself wish I learned to speak and write in Ilokano, my mother’s native language. But I never did. So I envy those three Laoag students. On the other hand, I also was more fortunate, in a way. Looking back a five centavo fine was nothing to get too agitated about. I was never threatened with expulsion or with being hit in the head with a cell phone for violating my school’s speak-English-only rule. So to the three Laoag students kicked out for defying their former school’s speak-English-only rule, I say: “Haan kay’ maawanan namnama. Adu’t kadwa ‘yo. Ituloy yo latta’t agsarita ‘ti Ilocano.